Steelers Control Their Own Destiny | "IT'S A STEELERS WORLD"! The Pittsburgh Steelers have a chance to do what they had a chance to do last season..”Control Their Own Destiny”! If the Steelers defeat the Kansas City Chiefs at Heinz Field on Sunday they will secure at least a wild card playoff spot. If they win the next two games not only are they in, but they are AFC North champions. The Steelers 27-20 victory over the Atlanta Falcons has them as the fifth seed in the AFC, holding on to the first wild card spot. But if they defeat Kansas City this week and the Cincinnati Bengals the following week, they will take the division. The Steelers, 9-5, are the fifth seed, followed by the Baltimore Ravens who are the sixth seed at 9-5 following Sunday’s win over the Jacksonville Jaguars. With two weeks remaining the AFC is still jumbled, with Kansas City (8-6), San Diego (8-6), Buffalo (8-6), Houston (7-7), Miami (7-7) and Cleveland (7-7) still in the hunt and battling to earn a postseason berth. 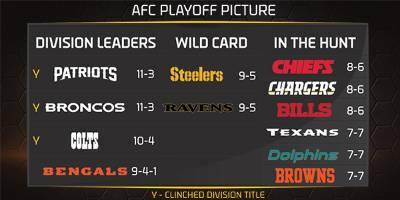 The race for a playoff spot and the AFC North continues to sizzle this week when the Steelers, who are 7-3 inAFC games,will host the Chiefs, while the Ravens are at the Texans, Browns are at the Panthers and the Bengals host the Broncos on Monday Night Football. > The division champion with the best record. > The division champion with the second-best record. > The division champion with the third-best record. > The division champion with the fourth-best record. > The Wild Card club with the best record. > The Wild Card club with the second-best record. > Head-to-head (best won-lost-tied percentage in games between the clubs). > Best won-lost-tied percentage in games played within the division. > Best won-lost-tied percentage in common games. > Best won-lost-tied percentage in games played within the conference. > Best combined ranking among conference teams in points scored and points allowed. > Best combined ranking among all teams in points scored and points allowed. > Best net points in common games. > Best net points in all games. > Best net touchdowns in all games. Three or More Clubs (Note: If two clubs remain tied after third or other clubs are eliminated during any step, tie breaker reverts to step 1 of the two-club format). > Head-to-head (best won-lost-tied percentage in games among the clubs). TO BREAK A TIE FOR THE WILD-CARD TEAM If it is necessary to break ties to determine the two Wild-Card clubs from each conference, the following steps will be taken. > If the tied clubs are from the same division, apply division tie breaker. > If the tied clubs are from different divisions, apply the following steps. > Best won-lost-tied percentage in common games, minimum of four. > Best net points in conference games. > Apply division tie breaker to eliminate all but the highest ranked club in each division prior to proceeding to step 2. The original seeding within a division upon application of the division tie breaker remains the same for all subsequent applications of the procedure that are necessary to identify the two Wild-Card participants. > Only one club advances to the playoffs in any tie-breaking step. Remaining tied clubs revert to the first step of the applicable division or Wild Card tie-breakers. As an example, if two clubs remain tied in any tie-breaker step after all other clubs have been eliminated, the procedure reverts to Step 1 of the two-club format to determine the winner. When one club wins the tiebreaker, all other clubs revert to Step 1 of the applicable two-club or three-club format. > In comparing records against common opponents among tied teams, the best won-lost-tied percentage is the deciding factor, since teams may have played an unequal number of games. > To determine home-field priority among division-titlists, apply Wild Card tie-breakers. > To determine home-field priority for Wild Card qualifiers, apply division tie-breakers (if teams are from the same division) or Wild Card tiebreakers (if teams are from different divisions).